Alibag and its surrounding villages are the historic hinterland of Bene Israeli Jews. There is a synagogue in the "Israel Ali" (Marathi इस्राएल आळी meaning Israel lane) area of the town. A Bene Israelite named Ali used to live there at that time. He was a rich man and owned many plantations of mangoes and coconuts in his gardens. 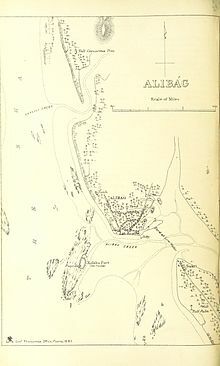 Hence the locals used to call the place "Alichi Bagh"(Marathi for "Ali's Garden"), or simply "Alibag", and the name stuck. Alibag houses a magnetic observatory which was set up in 1904. It serves as one of the significant observatories forming part of a global network now run by Indian Institute of Geomagnetism. The observatory has two buildings; the first building has magnetometers that record changes occurring in the geomagnetic fields. The second building consists of precision recording instruments, which give data about geomagnetic storms caused by solar storms which is shared with other countries. Alibag is located about 120 km south of Mumbai, at 18°38′29″N 72°52′20″E﻿ / ﻿18.64139°N 72.87222°E﻿ / 18.64139; 72.87222. The average elevation is 0 metres (0 feet).The District Government offices are located along the sea coast road. Alibag is the center place of Raigad District. Ca/Na ratio is mostly between 0.5 and 0.7, while the same seawater ratio is -0.038. Khemani's results for Alibag, Colaba, and Thane will give values of about 0.5,0.5 and 0.8 respectively (Khemani, 1974), which is indeed very close to the current ratio. Junge&Werby (1968) illustrated the excess Ca in the precipitation of the United States to the rainfall of Ca from arid regions. As our samples were not fully exposed during the actual rainfall, we retained the interpretation until further work was carried out. However, some excess calcium (perhaps 10-15%) may come from the ocean itself. Fairbridge(1966) also stated that tropical oceans have become over-saturated in terms of CaCO. So Nair et al. Ca. In some parts of the Arabian sea, values range from 470 to 1,000 PPM, representing higher values for coral reefs. The nearest rail railway station is at Pen. Through Pen, it is connected to Panvel and onwards to Mumbai and the Indian Railways network. Now pen-panvel trains are also started from 4 November 2018 now it is easier to reach alibag easily. The nearest jetty is Mandwa from where catamaran/ferry services are available to the Gateway of India, Mumbai. Another port in the vicinity is Rewas, from where a ferry service is available to Ferry Wharf (Bhau cha Dhakka) (Dockyard Road). There is a jetty at Custom Bandar from where fishermen in Alibag set sail. One can reach Alibag by catamaran through Gateway of India to Mandwa or from Bhaucha Dhakka to Rewas and from Mandwa/Rewas to Alibag by bus. Ticket includes journey from Gateway to Mandwa and bus journey from Mandwa to Alibag bus stop. The well known operators of these catamarans are PNP, Maldar and Ajanta and tickets can be purchased at their booth at the Gateway of India. From Rewas to Alibag one needs to take State Transport bus or a rickshaw. Take the ferry from Gateway to Mandwa. Services are usually available from 6:00am till 6:00pm. The trip takes 40 to 55 minutes depending on the type of boat. From Mandwa operators carry passengers to Alibag in their own chartered buses. The bus journey time is 45 minutes. Alibag beach is walking distance from the bus-stop. Speedboats from the Gateway of India to Mandwa Jetty take roughly 20–25 minutes depending on the weather and can be hired at the Gateway of India at Jetty No. 5 opposite the Taj Mahal Hotel. The new jetty installed in 2014 at Mandwa ensures safety of guests traveling by speedboat. The nearest airport is in Mumbai which is 140 km away by road. As of 2001[update] India census, Alibag had a population of 19,491. Males constitute 52% of the population and females 48%. Alibag has an average literacy rate of 79%, higher than the national average of 59.5%; with 54% of the males and 46% of females literate. 11% of the population is under 6 years of age. The Alibag Municipal Council has population of 20,743 of which 10,646 are males while 10,097 are females as per report released by Census India 2011. Population of Children with age of 0-6 is 1833 which is 8.84% of total population of Alibag. Siddheshwar Mandir near Khandale: This is a Shiva temple near hills near village Khandale just 4 km from Alibag-Pen state highway. You can drive your vehicles near to hillocks and with small trek you can reach this temple. During Shrawan month, hundreds of people throng to worship here during Shrawani Somwars. If you travel further you can see the remains of ancient fort called " Sagargad". From Siddheshwar Temple sagargad is 1 half hour away by treking. It is fully a natural place to enjoy with friends and family. but it is difficult to trake in mansson. there is no fix root like as kankeshwar. Khanderi and Underi Islands : one can visit Khanderi and Underi islands, They are heavily fortified and built by Shivaji as sea observation posts in 1660 CE. Most of the fort is intact. The most prominent structure is a lighthouse built in 1837 which is still in service and used for sea navigation. Nagaon Beach: This black-sand beach is about 10 km from Alibag and is famous for coconuts and betel nuts. One can walk on the beach from Nagaon beach to Akshi beach in ten minutes. Rewas: It is about 25 km from Alibag. From Rewas, there is a ferry boat service to Mumbai (bhaucha Dhakka) and to Uran (Karanja). Chaul Revdanda: It is situated about 17 km from Alibag. It is famous weekend tourist spot. Mandawa Beach as seen from Mandawa Port. Kashid Beach: It is 49 km from Alibag, on the Alibag-Murud highway, with almost 'white' sand. There are many cottages and resorts available ranging from around INR 1500 to INR 20,000. Prakruti resort is the luxury and the costliest of all. This village does not have any wine shops. One has to go around 6 km towards Murud to buy alcohol. Kashid is the perfect place to relax for urban people. One can find water sports facility and number of small shops for snacks. There is a danger board warning people of dangerous tides. Kolaba (or Kulaba) fort (not to be confused with Colaba in Mumbai) is in the sea 1–2 km from the Alibag shores. During low tide one can walk to the fort. The fort used to have a sweet water well. Datta Mandir: situated at bhowale,2 km from Chaul. Datta Tekdi (Veshvi): A Datta Mandir situated on a small hill near Veshvi. It is about 6–7 km from Alibag. Bhuvaneshwar Temple: It is situated at Narangi Village, 20 km from Alibag. It is a very famous and historical temple. Every year, there is a fair on Mahashivratri in Hindu calendar. On this hill, a variety of herbs are found. 15 Village are taking Care of management. They have established in management committee. SATVIRA Temple: It is situated at Shirawali village, 16 km far from Alibag. It is a very famous and historical temple. Every year, Navratri days many people visited this temple. On this hill, a variety of herbs are found. They have established in Shirawali village peoples. ^ Sequeira, Ronald (1976). "Monsoonal deposition of sea salt and air pollutants over Bombay". Tellus. 28 (3): 275–282. doi:10.1111/j.2153-3490.1976.tb00676.x. ISSN 2153-3490.